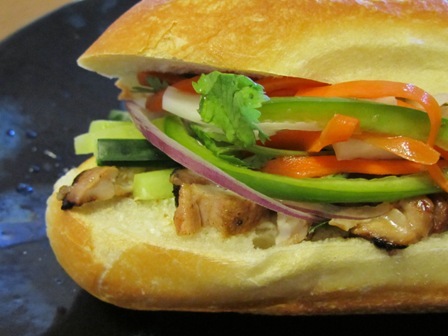 The Vietnamese sub is one of my all time favorite sandwiches. I love the pickled veggies and fresh cilantro. I love the taste of grilled meat. 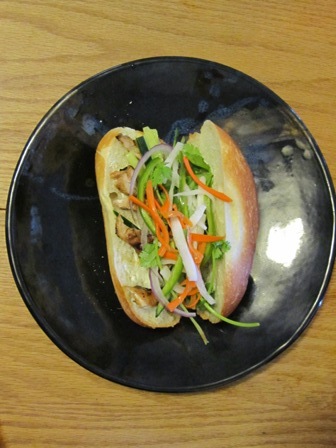 This is my version of the Vietnamese sub. I don’t know how traditional it is but it is still yummy. This recipe calls for lots of sauces. 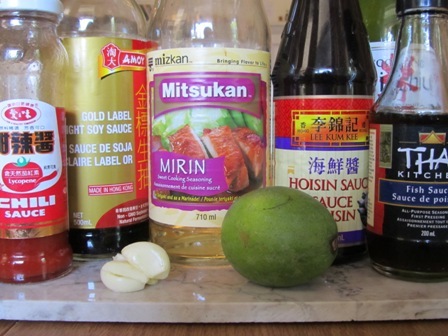 Begin by marinating the meat in mirin, soy sauce, fish sauce, rice wine vinegar, lime juice, garlic and sweet chili sauce. You can use any type of meat but I prefer chicken. Let the meat sit for at least an hour. Over night will even be better. Whenever I grill chicken I always use chicken thighs. They always remain juicy and never dry out. Next prepare the pickled veggies. You want them to sit for a couple hours as well. 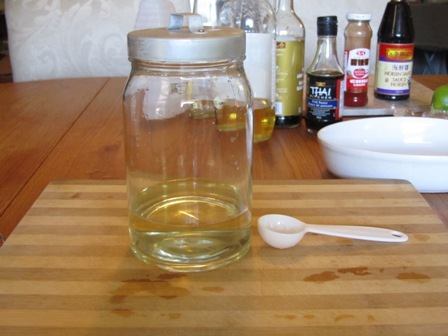 In a glass jar, prepare the pickling liquid. 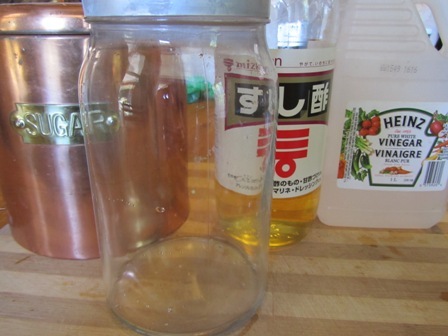 Mix rice wine vinegar, white vinegar, sugar, and water together. Taste the liquid. It should be both tangy and sweet. 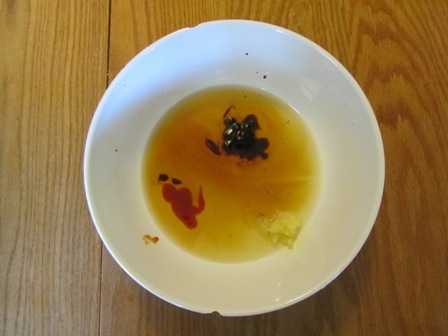 If it needs to be more tangy add white vinegar. 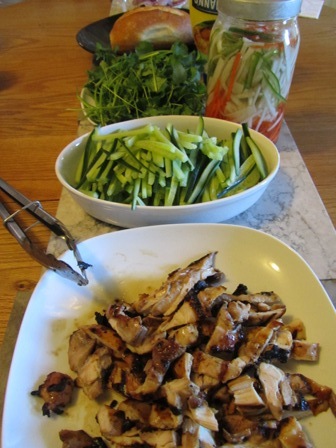 If it needs to be sweeter add sugar or rice wine vinegar. Mix well. You can add salt and pepper to taste. 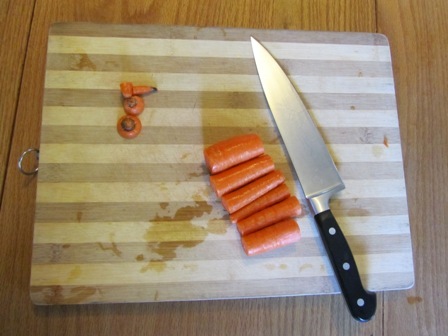 Julienne the carrots, diakon and jalapeno. 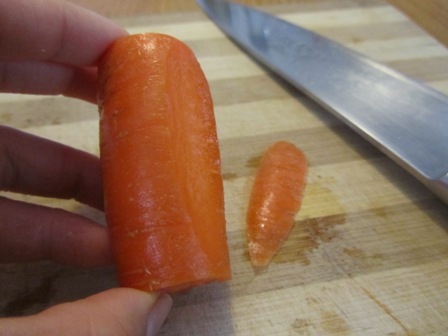 To make sure you don’t cut yourself, slice a piece off the end of the carrot. 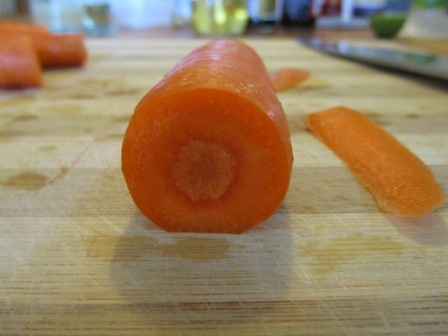 This provides a flat surface to cut your carrot and will prevent any wobbling. 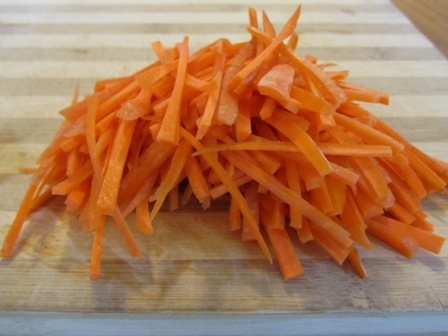 Slice the carrot into thin slices and then into match sticks. 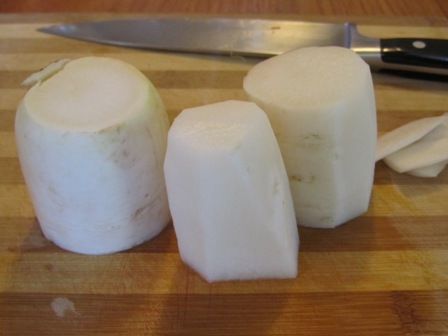 Continue with the daikon. First make sure you peel the diakon since the skin is a bit tough. 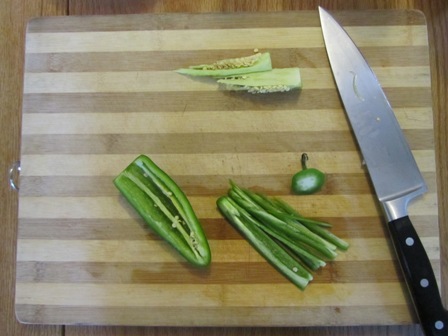 When you are cutting the jalapeno, make sure you wear gloves. The oils from the pepper will sting any open cuts and don’t rub your eyes! If you want the peppers to be spicier, leave the seeds and white membrane. 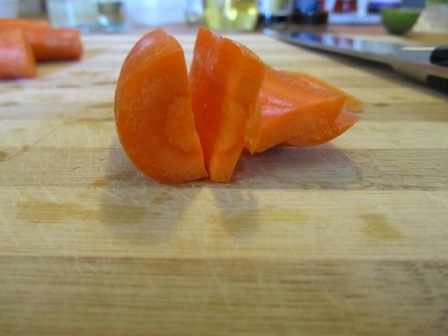 If you want a milder pepper, remove the seeds and white membrane. 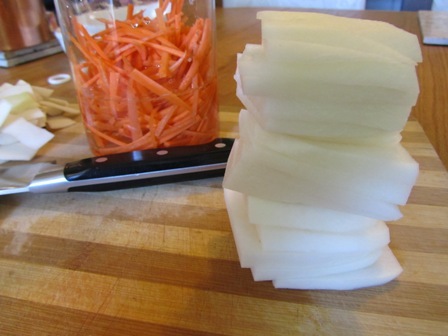 Place all the julienne vegetables into the jar. 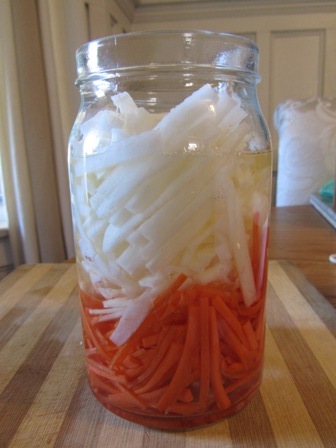 Fill the jar with enough pickling liquid to cover all of the vegetables. Its ok to make a lot since this will last for months. The jalapenos will start making the entire jar spicy. 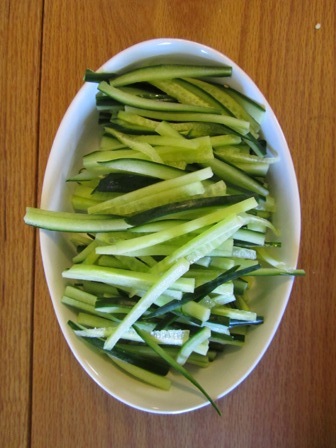 Cut up some cucumber and leave raw. The combination of fresh cucumber and pickled vegetables is amazing. The cucumber adds a fresh crunch. 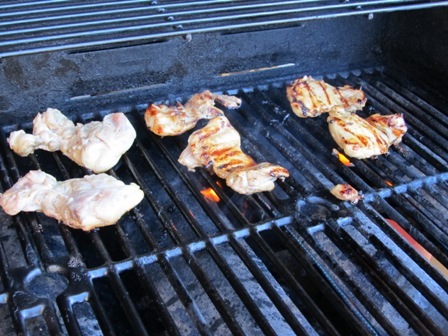 When you are ready to eat, grill the chicken on a BBQ or grill. It will give the meat a nice smokey flavour. Slice the chicken into bite sized pieces. Lay your ingredients out and allow your guests to make their own sandwiches. Make sure you use extra crusty bread such as french bread or crusty rolls. It will make a huge difference. I like to spread a bit of mayo onto my bun before adding the rest of the ingredients: chicken, cilantro, pickled vegetable, red onion, and cucumber. Mix all ingredients in a bowl. 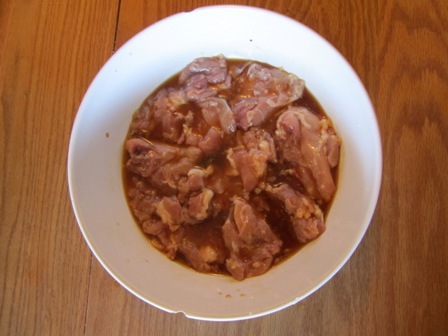 Marinade meat for at least one hour or overnight. 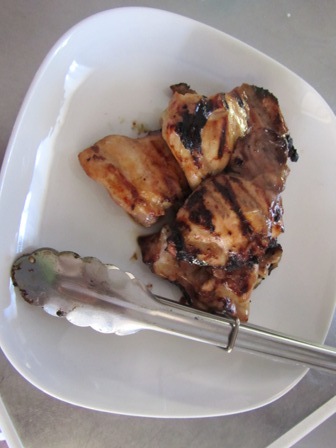 Remove the meat from the marinade and grill or BBQ. Slice cooked meat into bite sized pieces. Mix the sugar, vinegar, and water together until the sugar is dissolved. 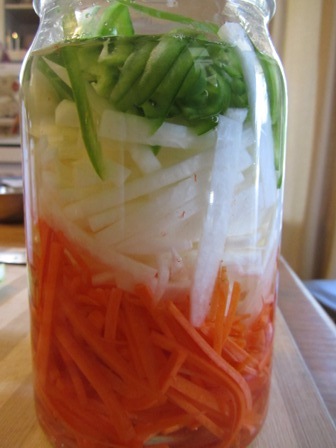 Put julienne carrots, diakon and jalepeno peppers into a jar and pour enough pickling liquid to cover the vegetables. 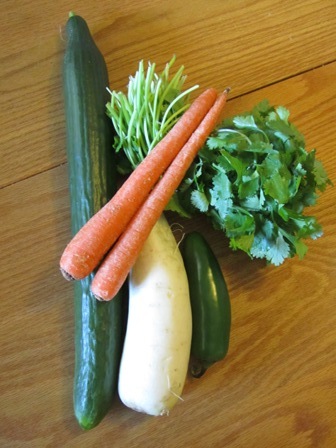 These vegetable will last a month or two. Spread mayo on both sides of the sandwich. Layer the ingredients in the sandwich.